Details the discovery of Dodd's Spark Station inside a steamer trunk in Reno, Nevada in November 1999. Details on Dodd's equipment, the station's location, how it worked and where it is now. Lots of photographs including original vintage B&W photos of Dodd using his station in 1912, photos of Dodd's 1909 Award-winning Station, other vintage Dodd photographs plus contemporary photos of the Dodd station as it was set up on display in the Western Historic Radio Museum. Appendix includes write-up of Dodd's 1923 homebrew 3-tube Cockaday Receiver. Colin B. Kennedy - "Radio Apparatus of Quality"
Comprehensive history of the design and manufacturing of Kennedy's 1922 line of high-quality receivers. Details on the Type 110 Universal, the Type 220 Intermediate Wave and the Type 281 Short Wave. Also covers the Type 525 and Type 521 Audio Amplifiers. Restoration information and write-up of a Type 220 restoration. Performance testing the Type 110 and performance testing the Type 220. Also includes a write-up of our experiment duplicating Dr. Royal Rife's use of the Kennedy receivers in his laboratory. Lots of photos. A. H. GREBE & CO., INC. - "A Guide to the Grebe Synchrophase MU-1"
Part Two - Engineering Upgrades, Serial letter dilemma, Restoration hints, How to neutralize the MU-1, Performance testing Early model CTPB and Late Model RJNA. Lots of photos. SE-1420, IP-501 & IP-501-A - "The Classis Shipboard Wireless Receivers"
Comprehensive history of the design and manufacturing of these classic shipboard receivers. Detailed restoration write-ups. Performance testing the SE-1420B and the IP-501-A. How to set "Critical Coupling" and attain real DX performance. NDB Station Log for the IP-501-A. Lots of photos. Detailed history write-ups and performance evaluations on several different models of pre-WWII, WWII and post-WWII LW receivers with examples from the US Navy, US Army Signal Corps, Radiomarine Corp., Mackay Radio, Hammarlund, Collins and National Company. Includes info on using vintage LW gear on 630 meters. Lots of information and lots of photos. Part Three - Collins R-389/URR (with rebuild info,) Hammarlund SP-600VLF-31 (with performance details,) Selective Level Meters, Regenerative versus Superheterodyne on LW. Part Four - What to listen to below 500kc, VLF Stations, 630M amateur operation. 2007 Photo-tour of Loran-C "Master" Station in Fallon, Nevada. NDB stations in Nevada. Complete NDB reception log. National Company, Inc. - HRO Receiver - "The Cream of the Crop"
Comprehensive history of the design and manufacturing of the HRO. Serial number log for determining build date of your HRO. Several restoration write-ups. Lots of photos and information. Comprehensive history of the design and manufacturing. Details on most of the sixty+ different types of Moving Coil receivers. Includes details on the Airport Receivers, the WWII versions and the post-WWII versions. Serial Number Analysis and Log. Several detailed restoration write-ups. Serial number analysis and log. Lots of photos and lots of information. Hallicrafters SX-28 - "A Pre-war Masterpiece"
Comprehensive history of design and manufacturing. Includes the SX-28A, AN/GRR-2, R-45/ARR-7 and other receivers. Serial number analysis and log allows dating your SX-28. Restoration information. Performance comparisons. Lots of photos. Detailed history of design and manufacturing. Profile of XE1G ham station the first amateur diversity receiver. DD-1 prototype information. Serial number analysis. List of current owners of known DD-1 receivers. Restoration information. Performance details. Lots of photos. Comprehensive history of the U.S. Navy's first superheterodyne long wave receiver. Continuing Restoration of RAA-3 SN: 64 - a journal-type write-up of the "ground-up" restoration of this behemoth of a Navy receiver. Weighing 465 pounds and comprising three individual sections, this ultra-rare receiver was stored outside, wrapped in a tarp. A real restoration challenge. Lots of photos. Comprehensive history of the AR-88 family of receivers with circuit details and variations in construction. Includes details on AR-88D, AR-88LF, AR-88F, CR-91, CR-91A, CR88, CR88A, CR-88B, including triple diversity receivers RDM, DR-89, OA-58. Sweep Alignments, Restoration Hints, Serial Number Analysis. Collector Photo Gallery. Lots of photos and lots of information. Comprehensive history of the AR-60 receivers, includes all RCA versions and the U.S. Coast Guard CGR-32 versions. Circuit details, alignment, adjustments, critical analysis of the infamous 1936 "R-9" magazine review of the AR-60, Serial Number Analysis. Collector Photo Gallery. Lots of photos. Hammarlund Mfg. Co., Inc - "The Incredible Pre-war Super-Pro"
Comprehensive history of the Super Pro receivers, includes SP-10, SP-100, SP-200, BC-779, BC-794, BC-1004, SPA, R-270 Wickes Eng. version and other military versions. Includes special appendix on the Hammarlund Comet Pro receiver, the predecessor to the Super Pro. Restoration details on SP-10 and SP-100 receivers. Collector Photo Gallery. Lots of photos and lots of information. 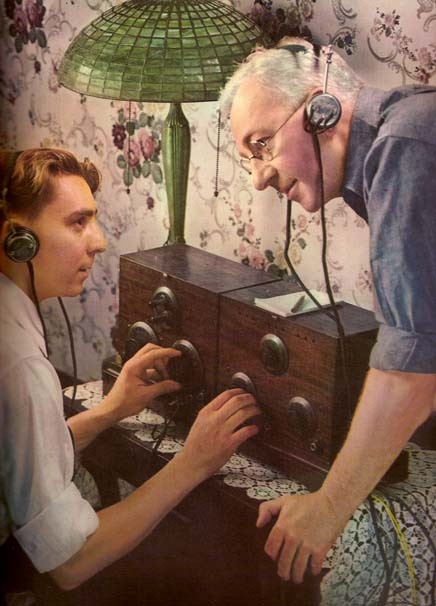 Comprehensive history of Patterson Radio Company and 1930s Los Angeles radio manufacturing. Detailed circuit analysis, red-lined corrected schematic, frequency calibration chart (so you know where your PR-10 is tuned.) Restoration details on Velvet Tuning rebuild and more. Collector Photo Gallery. Lots of photos and information. Comprehensive history of Hallicrafters' Super Pro, the R-274 receiver, circuit description, performance analysis, detailed comparison between the R-274 and the Hammarlund SP-600, pros and cons of each receiver. You can VOTE for your favorite "Super Pro" - either Hallicrafters' or Hammarlund's. Voting results are shown (you might be surprised at the results.) Lots of photos and information. Part Three - Restoration profile of the USAAF ART-13A Basket Case, Restoration profile of the USN Collins ART-13 "typical restoration"
Detailed information on how to power the BC-375 to avoid problems that include "FMing," non-symmetrical modulation, low power output and more. How to perform "dynamic neutralization" to eliminate audio distortion due to parasitic oscillations. Interfacing the BC-375 with the BC-348 receiver. Post-War Ham Gear - National Co, Hallicrafters, Collins, E.F. Johnson including the "Navigator Deluxe," Eldico, Homebrews including the W6MIT "1625 Rig"